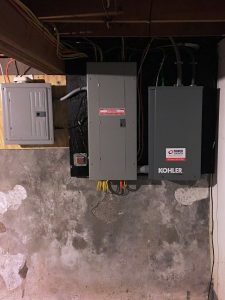 This homeowner wanted to be certain to stay connected in the event of an outage. The business world never shuts down and this customer will be able to continue working as usual in the event of an outage. Our world has changed and the way we do things has also changed as a result of the computer age. Just think some people even order their groceries on line not to mention bill paying and banking. Just like businesses we all need a backup generator to function in today’s world. To enable the homeowners to live life as close to normal when the power goes out.